Green beans are my favorite vegetable forever and ever….always have been, always will be. Canned, boiled, sautéed, with bacon and without (though always better with bacon! ), you can’t go wrong with them. But roasting them is by far the best way to serve them….even my kids agree! 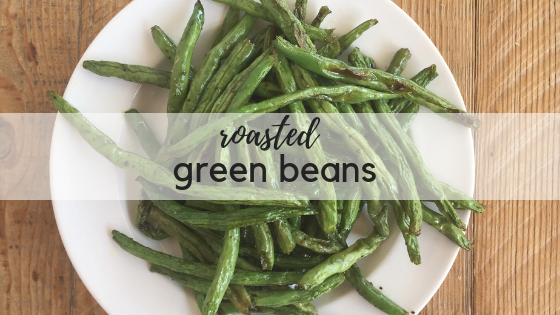 There’s just something almost french-fry like about green beans when they’re brown, slightly crispy and salty….give them a try! 2. Line large sheet pan with parchment paper or foil. 3. 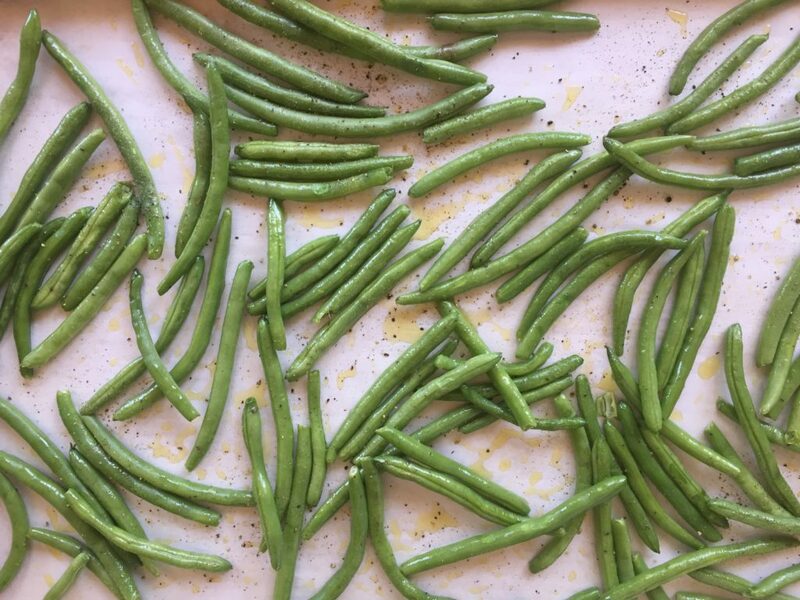 Add green beans to sheet pan, drizzle with 1 tablespoon olive oil and toss to coat. 4. Spread green beans into single layer, and salt/pepper to taste. 5. Roast 30-40 minutes, or until green beans start to blister and get brown spots on them, stirring once half-way through cooking time. Roast as directed, let cool completely then store in an airtight container in the refrigerator several days. Reheat in microwave, or in lightly oiled skillet over medium heat. They won’t be crispy, but still delicious! #1-Do not crowd the pan! Spreading them out in a single layer ensures even cooking and browning. The can be barely touching, but not completely covering the bottom of the pan. you could add a few more beans to this pan, but not many! #2-You could season these so many ways: just salt and pepper, add garlic powder, everything bagel seasoning, nutritional yeast, or any combination of red pepper flakes, smoked paprika or onion powder.